An old factory in Hunts Point has been given new life as a colorful learning center for kids, thanks to the team over at WXY Studio. 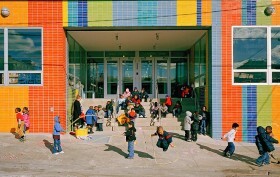 The Bronx Charter School for Arts was built using 80 percent repurposed materials, with the the biggest recycled piece being the façade. Though on a tight budget, WXY Studio was able to reinvent this space using cost-effective strategies and featuring some cool eco-friendly highlights.